The following is a list of links where you can find lots of items for veterans on Veterans day! I am not going to copy and paste to list them all here as I would rather give them the credit for all their hard work. Please go check out their pages and see what you can find for you or your veteran this Veterans Day! I am adding this now as we only have a few more days and I would love to see you find something and plan ahead for a special treat for yourself or your veteran. I have something in the works for my Veteran. (what that is exactly will depend on rather we have a sitter or not. :)) I can tell you one thing. My husband is very PROUD to be a Veteran. He also LOVES the reward he gets from a little recognition with a deal on Veterans day. So Thanks to all of the businesses that take the step to show the Veterans thanks on this special day. Wzzm 13 list for Grand Rapids Area but some may work for you if you have a national chain near you. Disclosure: You may notice if you have entered my giveaways that I have this page added on the bottom for you to like to gain an entry. This is of my own doing. They did not endorse my giveaways in anyway nor was I compensated for this post in any way. 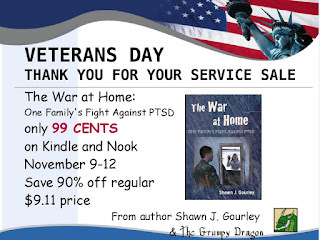 I enjoy reading the page as they are trying to raise awareness to PTSD and other things that returning service members face. I find valuable information there and that is the reason for any posts I have done concerning them.